Canada is "actively considering" deploying Magnitsky Act sanctions over the murder of journalist Jamal Khashoggi, Foreign Affairs Minister Chrystia Freeland said today. "We are very aware of the U.S. sanctions on certain Saudi individuals and we have been in close contact with the U.S. about those Magnitsky sanctions," said Freeland, in Port Colborne, Ontario this afternoon for a media availability to discuss the new USMCA trade deal. "Canada welcomes the U.S. action. When it comes to Canada, we also do have Magnitsky legislation in place and that is a tool that we have found very useful in our foreign policy. And that is certainly something which in the coming days Canada is actively considering." The U.S. Treasury announced Magnitsky Act sanctions on 17 Saudi officials today in respose to their role in Khashoggi's murder. It's the first policy response by the administration of U.S. President Donald Trump to the journalist's death. Saudi Arabia is a key American ally in the Middle East. Khashoggi vanished on Oct. 2 after entering the Saudi consulate in Istanbul to obtain paperwork he needed to marry his Turkish fiancée. Five days later, Turkish officials alleged that he had been tortured, killed and dismembered at the diplomatic outpost. 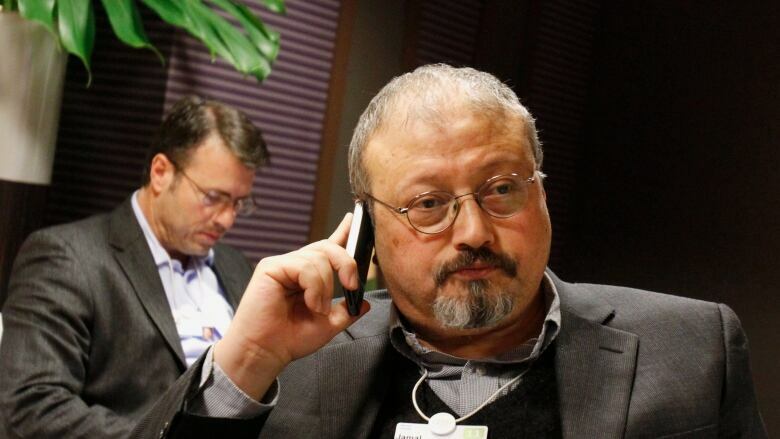 The Saudi government initially denied any involvement in Khashoggi's disappearance, but eventually admitted he had died at the consulate. Today, just hours before the U.S. Magnitsky sanctions were announced, Saudi Arabia's public prosecutor said the death penalty was being sought for five out of 11 suspects charged in Khashoggi's murder. The Conservative Opposition is urging the Trudeau government to match Washington's move on Magnitsky sanctions. "Justin Trudeau has the power to do the same under the Magnitsky Law that was introduced by the Conservatives. The Liberal government should move on this immediately alongside our allies," says a media release from foreign affairs critic Erin O'Toole and defence critic James Bezan. "As a global leader on human rights, we have a duty to act swiftly to condemn barbaric acts against journalists, human rights activists and dissidents." Khashoggi, once a Saudi royal family insider, grew critical of the kingdom's rulers following their crackdown on opposition, their war on neighbouring Yemen and the severing of Saudi ties with the small Gulf state of Qatar. The United States' Magnitsky Act was passed in 2012 under President Barack Obama. It's named for Russian lawyer Sergei Magnitsky, who died in a Moscow prison after he was arrested over an alleged tax fraud. The law allows the U.S. government to sanction human rights offenders abroad, seize their assets and ban them from entering the United States. Canada's own version of the Magnitsky Act was passed last year. While Canada has always had discretionary powers to sanction any government it sees fit, the Magnitsky Act goes further, giving the government powers to freeze assets owned by individuals if the government believes them to be involved in corruption, money laundering and human rights abuses in their own countries. The federal government has used the act already to on impose sanctions on 52 officials from three countries: Venezuela, South Sudan and Russia.